Countless research has established that eating vegetables and fruit is healthy, and can lower the risk of diseases such as dementia, stroke, arthritis, cancer, and heart disease. Now, new evidence published in the American Heart Association’s journal Circulation found that eating more fruits and vegetables during young adulthood may reduce your risk of heart disease 20 years later. The researchers discovered that the young adults who consumed seven to nine portions of vegetables and fruits a day would have a significantly reduced chance of calcified coronary artery plaque 20 years later when compared to those with low fruit and vegetable habits. For the study, the researchers analyzed 2,506 participants who were part of the Coronary Artery Risk Development in Young Adults (CARDIA) study. In 1985, the participants completed a questionnaire that detailed weight, diet, smoking habits, and cardiovascular risk factors. The participants were assigned to groups based on their daily vegetable and fruit intake. Of the group with the highest vegetable and fruit consumption, the men ate 7.2 portions on average per day and women consumed an average of 8.9 daily portions. In those with the lowest intake of vegetables and fruits, the men consumed an average of 2.6 servings daily and women ate 3.3 servings daily. In 2005 and 2006, the study participants underwent a CT (computed tomography) scan to assess calcium buildup in the heart’s arteries. Results helped determine a coronary artery calcium score. The greater risk of coronary heart disease and heart attack was associated with higher calcium scores. There was a 26% less chance of developing calcified coronary artery plaque when the participants consumed the highest vegetable and fruit intake during young adulthood 20 years earlier when compared to those with the lowest vegetables and fruits consumption during young adulthood. The women in the study with the highest vegetable and fruit consumption had a lower calcium score than those women with a low fruit and veggie intake. On the other hand, the men with high vegetable and fruit intake didn’t have a significant difference when compared to the men in the low veggie and fruit group. There were only 935 men in the study, which may have affected the results. The authors noted that vegetable and fruit intake should be established early in life; however, it doesn’t mean that those eating healthy later in life still wouldn’t benefit from the lifestyle change. Other research also supports greater fruit and vegetable consumption for protection against heart health. For instance, a group of studies from 2014 found that the nitrates found in green vegetables may improve heart health and decrease the risk of diabetes and obesity. Many other studies also support an association of fruit and vegetable intake with a reduced risk of heart disease, including an epidemiological study published in the American Journal of Clinical Nutrition in 2002. Brauser, D., “Early Fruit and Veggie Intake Can Lower Later Calcium Scores, Says Study,” Medscape Multispecialty, October 26, 2015; http://www.medscape.com/viewarticle/853236. Miedema, M.D., et al., “The association of fruit and vegetable consumption during early adulthood with the prevalence of coronary artery calcium after 20 years of follow-up: The CARDIA study,” Circulation 2015, doi: 10.1161/CIRCULATIONAHA.114.012562. 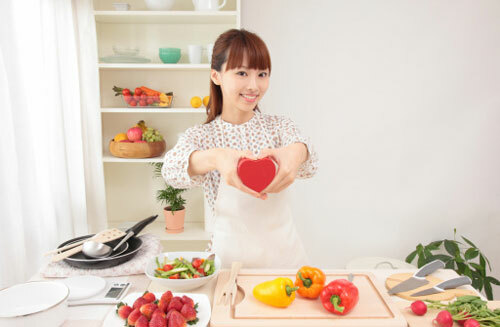 “Eat more fruits and vegetables in young adulthood for a healthier heart,” Medical News Today web site, October 27, 2015; http://www.medicalnewstoday.com/articles/301496.php. “Eating more fruits and veggies in youth linked to healthy heart decades later,” American Heart Association web site; http://blog.heart.org/eating-more-fruits-veggies-in-youth-linked-to-healthy-heart-decades-later/, last accessed October 27, 2015. Bazzano, L.A., et al., “Fruit and vegetable intake and risk of cardiovascular disease in U.S. adults: the first National Health and Nutrition Examination Survey Epidemiologic Follow-up Study,” American Journal of Clinical Nutrition July 2002; 76(1): 93–99. “Eating more green vegetables may aid heart health, reduce risk of obesity, diabetes,” Medical News Today web site, December 7, 2014; http://www.medicalnewstoday.com/articles/286515.php.